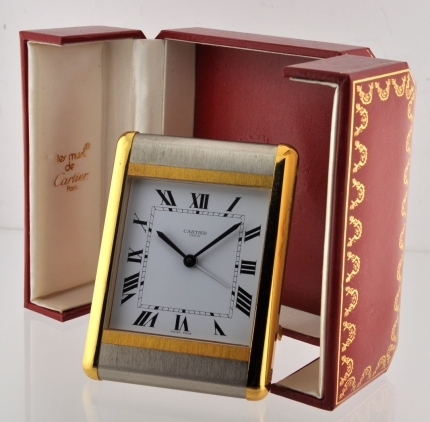 This is a circa 1990’s original Cartier Quartz Alarm desk Clock. The case is two-tone gold plated and steel and measures 3 3/4″ x 2 7/8″ and 1″ thick. Notice the Cartier cabochon tipped setting button. The original Cartier coffin style box is included. This exquisite battery operated clock is working perfectly and would make a lovely gift. Only $995.